I am officially partied out! After two days of graduation parties last week, I helped to throw two more parties this weekend...all while preparing my family to leave for a month on Wednesday. Being the ultra creative and flexible person that I am (not), I am a little exhausted. I've come to terms with the fact that I'm never going to be one of those women who others ask, "how does she do it all?" Unless you were wondering, how does she bobby pin her bangs back onto still dripping wet, towel-dried hair? Or, how does she make such good frozen pizza? With the busyness of my life right now, I think I could write a cookbook on frozen pizzas. Back to the parties...On Saturday night, I helped to throw a baby shower for a really good friend of mine named Ruthie. She's Norwegian, and her husband and her leave this week to have the baby in Norway! It was quite fun to celebrate her & the baby before they leave. Then last night, Ruthie and I threw a joint surprise birthday party for our husbands! The boys thought that we were just having dinner together - so they were quite confused when their friends showed up! This group of guys loves to have "man time" together, so we sent them off to have dinner at a pub. Pubs are manly, right? While they were at dinner, Ruthie and I prepared dessert at my house for all of the guys and their wives. People stayed late and it was a ton of fun! Well, it's Monday morning, and I leave on Wednesday at 5am...so this girl needs to get off the computer and get packing! 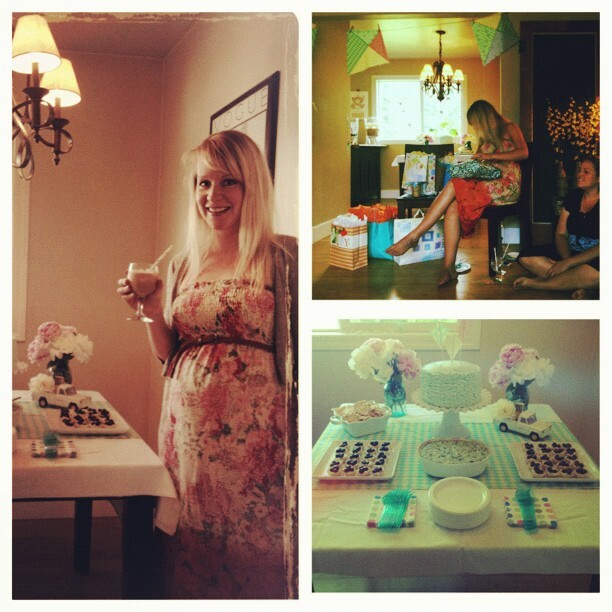 If you want to see some beautiful pictures of Ruthie's baby shower, please visit Jenn's blog! She made the most gorgeous cake ever! Blueberry-lemon tarts for the shower. I'll be sharing the recipe soon! (Thanks Jenn and my sister for the recipe!) I think they'll be my new go-to recipe for parties. A few pictures by Ruthie. Isn't she beautiful? Nicholas' fake tears. He was getting bored when I was cleaning my house for Brian's party, so he started to fake cry. And produced some tears! I'm kind of impressed. Do you have any go-to recipes when you're hosting a party? 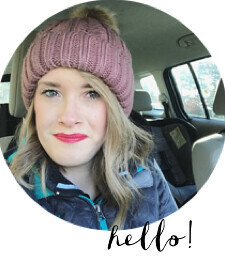 Or any tips for long car trips with an (almost) 7-month old? I'd love to hear them! Good luck on your trip! I do have a little recipe for sausage cups, always so delicous! I don't remember it, something about sausage, ranch seasoning (I know, but seriously!) cheese and wonton wrappers... I love when stuff looks more impressive than it is! my party recipe go-tos are: spinach & artichoke dip, buffulo chicken dip, fruit salad, & cold veggie pizza (recipe on my blog : http://happythehomeblog.blogspot.com/2011/03/spring-fling-week-5-spring-veggie-pizza.html) soooo good! those blueberry lemon tarts look amazing. can't wait for the recipe! That's a great idea for a guy's birthday party. I'll have to keep that in mind for my own guy! Last night the couple who usually hosts my book club couldn't host, so I offered and only had about 45 minutes to prepare some snacks for book club. I made this cookie pie: http://soozind.blogspot.com/2012/03/m-cookie-pie.html. It's super easy and quick! And delicious. Sorry, no tips for car trips with a 7-month-old. I'm sure I'll be coming to you someday when I have one of my own! Great job on the shower! We just took a four hour road trip with our two kiddos. It is a fun adventure! Hope you guys have fun on yours.